One of my favorite dishes at the King and Prince Resort was their Crab Cake Benedict. The chef was kind enough to let me share his recipe with all of my friends and followers. Welcome to my new favorite breakfast, Crab Cake Benedict. 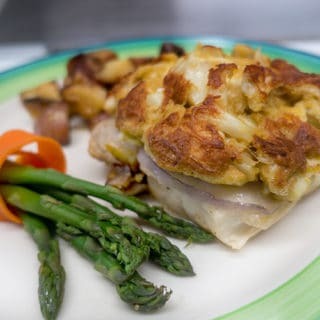 Thanks to Chef de Cuisine at Echo Oceanfront Restaurant, James Flack for sharing his crab cake recipe so you can make this delicious dish at home! When I travel, it’s almost as much about the food as the location. 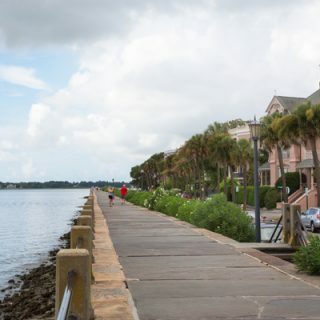 And during a recent trip to St. Simons Island, I was treated to one gastronomic delight after another while staying at the King & Prince Beach and Golf Resort. This oh so delicious crab cake Benedict was only the beginning! Inside this beautiful resort is a delightful dining space that caters to your every wish and then some. 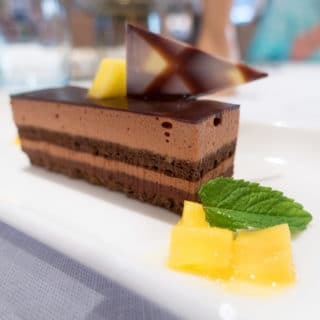 Artfully crafted dishes created by a talented culinary team at the resort’s restaurant Echo Oceanfront will keep you anticipating your next meal at this trendy restaurant. Our first night at Echo I had the pleasure of enjoying their Shrimp and Grits. It was a delicious combination of flavors. Wild Georgia shrimp, collard greens and andouille étouffée made this Shrimp and Grits one of the best I’ve ever had. Our lunch the following day was Echo’s take on Tuna Nicoise Salad. 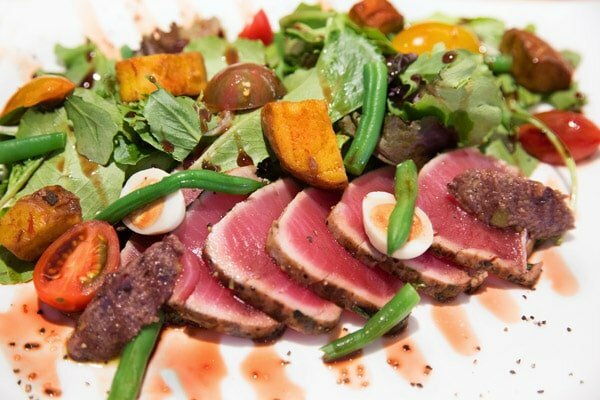 Chilled ahi tuna, saffron potato, heirloom cherry tomatoes, green beans, olive tapenade, quail egg and a port wine gastrique made up this delicious dish. 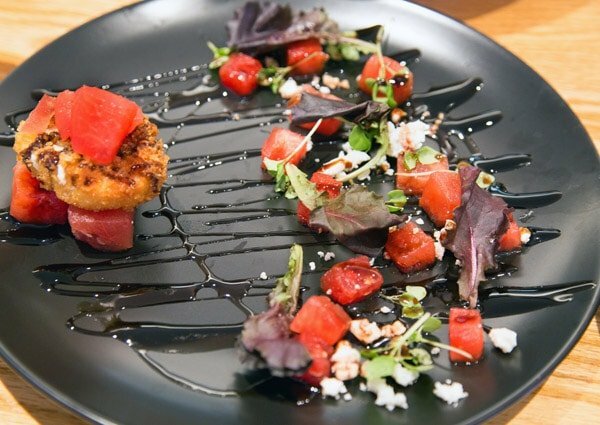 We also tried the Watermelon & goat cheese salad, made up of fresh watermelon, fried panko goat cheese, cilantro and a balsamic reduction. The ingredients perfectly complemented one and another. 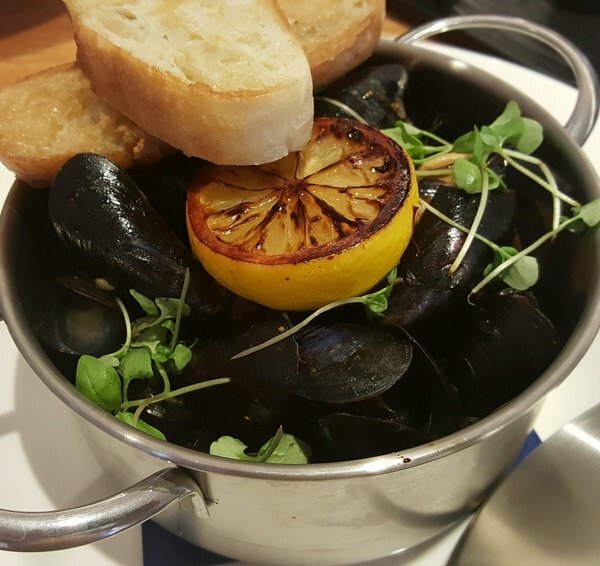 I also got to sample the sautéed mussels. They were seasoned with shallots, saffron, garlic, white wine and lemon juice, served with crostini. Absolutely delicious! But the Main Event later that evening was a five-course dinner, each course paired with its own wine to enhance the meal. I was at the King & Prince for a Travel Writers gathering to review the resort. Not only did I get to enjoy this delicious fare, I also made some great new friends that were on the trip with us. After all, food is the one thing that makes strangers friends. Add in an array of delicious wines and you’ve got a party! Our first course of the evening, was a house specialty appetizer, Fois Gras Tarte Tatin. 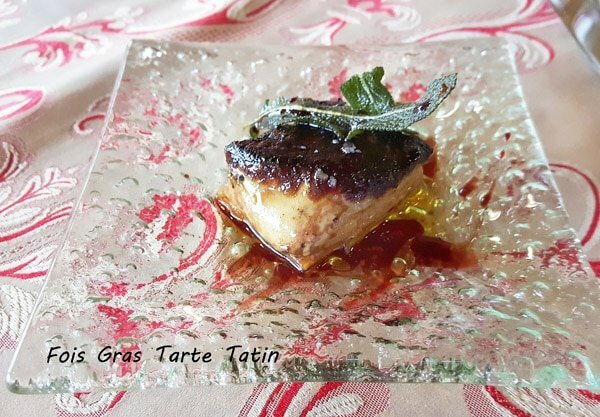 Seared Foie Gras and Figs on Puff Pastry with a leaf of Fried Sage on top and a light drizzle of Georgia Muscadine Reduction. The wine paired with this dish was Chateau Lauvignac Sauternes from France. We were off to a delicious start, and I was amazed at how well the sauternes went with this dish. Our second course was a Farmers Salad consisting of the chef’s daily selection of farm fresh cooked and raw vegetables tossed with mixed greens and lemon vinaigrette. The wine paired with the salad was Raimat Albariño, from Costers del Segre in Spain. 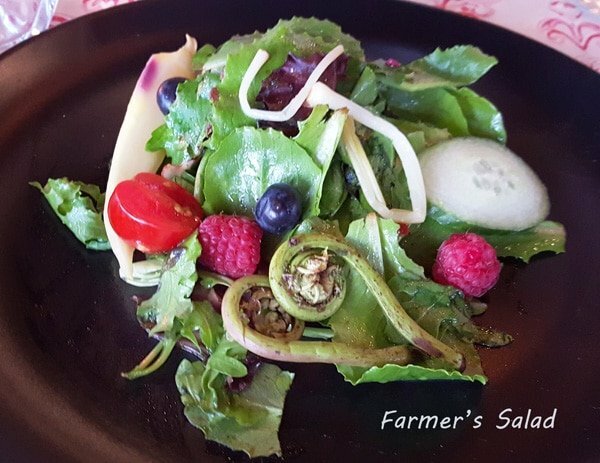 I loved seeing the Fiddlehead Ferns in this salad. If you’re not familiar with Fiddlehead Ferns, look for them at your local farmers market and give them a try. Next, came the first of two entrees. 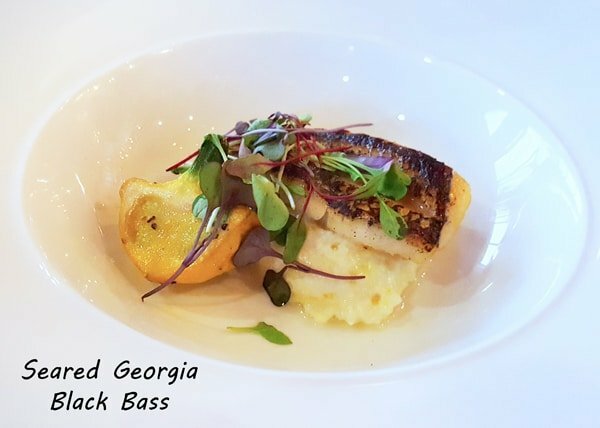 Seared Georgia Black Bass served over Geechie Boy grits with summer squash. If you’re not familiar with Geechie Boy Grits, they’re grown on a farm on the Georgia coast on Edisto Island. The wine paired with this course was Gerard Bertrand Pino Noir Reserve Special from Languedoc, France. 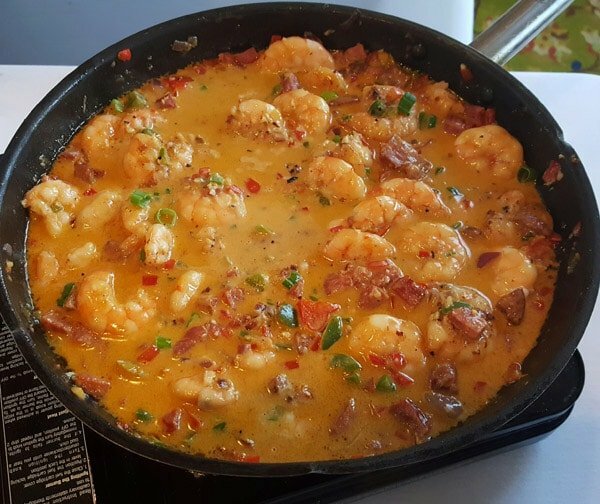 If you’d like to learn more about the Geechie Boy Grits click on the link to their website, where you can order your own online. 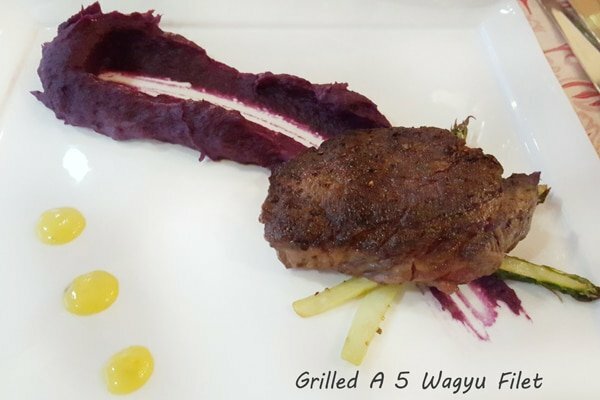 The second entree course was the pièce de résistance, a Grilled A 5 Wagyu Filet. The filet was served with a purple sweet potato puree, asparagus, and Bearnaise sauce. If you’ve never had true Wagyu beef, you don’t know what you’re missing and A 5 Wagyu is the highest grade of this Japanese beef. You could cut it with a fork…..simply amazing! The wine paired with the filet was Ghost Pines Cabernet Sauvignon, from Napa and Sonoma, California. 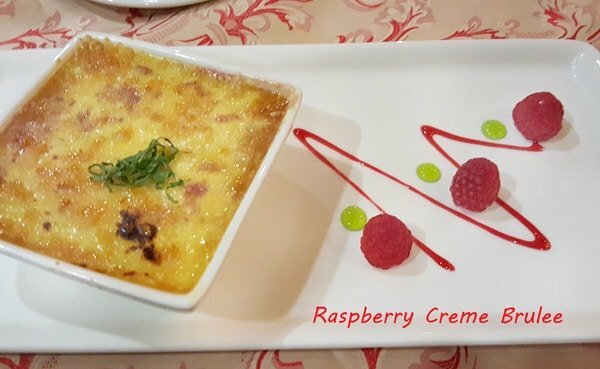 Our dessert course was Raspberry Creme Brulee topped with Saint Augustine Vodka-Soaked Turbinado Sugar and Mint. The wine paired with our dessert selection was Anna di Codorniu Cava Brut Rose from Spain (my favorite wine of the night). It was the perfect end to an ah-mazing meal! Of course not to be outdone by dinner, Echo provided an amazing assortment of breakfast treats the following morning on the buffet they provided for us. Talk about presentation! 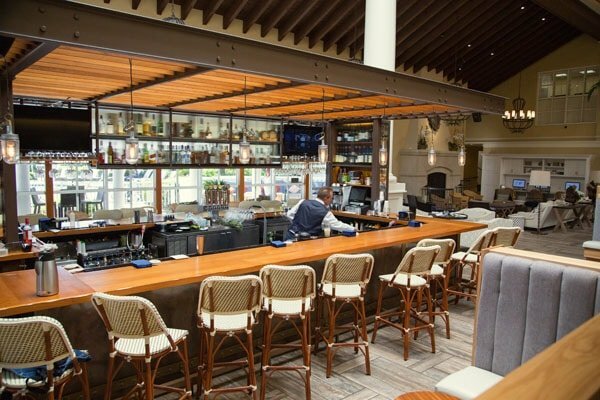 Food and Travel, they go perfectly together and when planning your vacations you need to make sure that the food you get to enjoy your vacation matches the experience you get at the resort you choose. 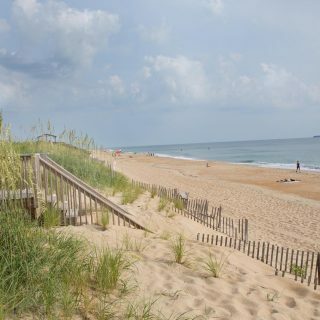 The King & Prince resort exceeded my expectations with their luxurious beachfront accommodations and all the deliciousness they served up at Echo Oceanfront Restaurant. 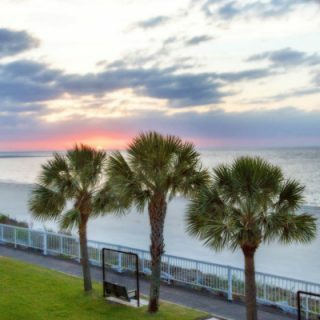 This is an affiliate link and If you are booking a trip to St. Simons Island or anywhere else in the world I would appreciate it if you could use this link. The added income helps me keep traveling and writing about my travels. To moderate the heat, frequently move the bowl off the heat for a few seconds, and then back on. (If, by chance, the eggs seem to be cooking too fast, set the pan in the bowl of cold water to cool the bottom, then continue). Create a gentle whirlpool in the water by stirring with a spoon before adding the eggs. This will help the egg white wrap around the yolk. Slowly tip the egg into the water, white first. Allow to cook undisturbed for three minutes. Top each side of the muffin with a crab cake, poached egg and hollandaise sauce. Garnish with fresh chopped Parsley and finely diced red pepper if you desire some color. This is very good and a great variation is to serve on a slice of fried green tomato instead of the English muffin. Both are delicious. Thats a great idea Patti, thanks! This looks amazing and probably tastes even better. I have saved it, and will be definitely be making it. 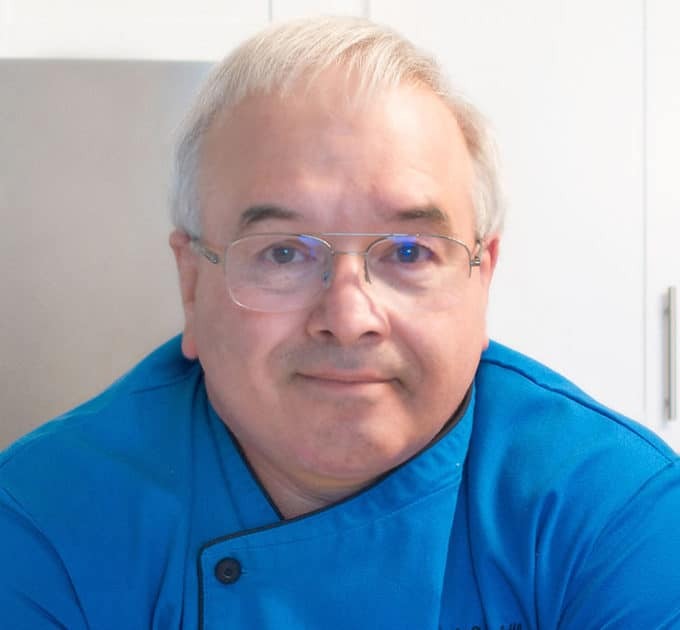 Thank you, Chef Flack, for so kindly sharing this! Thanks Charlie! They were so very very good! 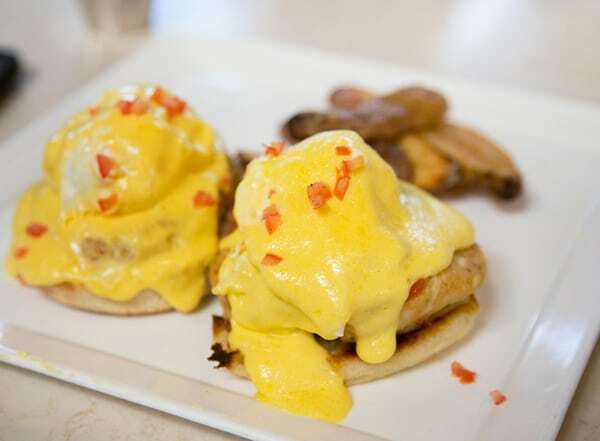 That crab cake benedict recipe looks and sounds amazing!! Definitely need to give this a try, PINNED!! It was so delicious and a variation on the classic dish I’d never tried before. I hope you get to try it soon!